Pioneer DJ is launching the RMX-1000 for iPad: the tactile iOS app that lets producers add high-quality FX to tracks in their iTunes library. The RMX-1000 app really comes into its own when linked to the Audiobus app and Inter-App Audio, which will let them add FX to music they’ve made on their iPad. Launched in 2012, the RMX-1000 is a hugely popular effector that can be used in the studio and for DJ performances. Now the RMX-1000 app emulates the hardware to deliver touchscreen control of Scene FX, Isolate FX, X-PAD FX and Release FX. Just like the RMX-1000, the app lets producers customise the parameters of the FX to create their own unique sound. The RMX-1000 iOS app supports the Audiobus app (bought separately) and Inter-App Audio, which means producers can add FX to music they’ve created using DAW apps control and record their creations using one simple GUI. The RMX-1000 for iPad is available from October 2015, at an SRP of $19.99 or €19.99, including VAT. 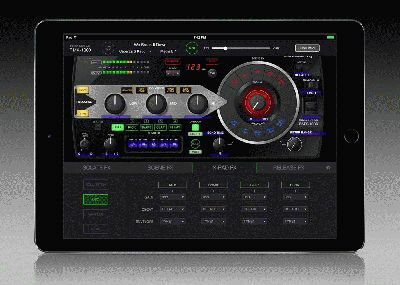 The RMX-1000 app is available at half price ($9.99 including VAT) until 11th November 2015. Trigger pre-assigned samples in time with the BPM and use the X-PAD to repeat samples at different speeds. Kick, Snare, Clap and Hi-hat are pre-assigned, or producers can customise using other on-board samples. PLUS – the parameters of many of the FX can be customised so producers can create unique sounds and experiment with their own style. The RMX-1000 for iPad can be linked to the Audiobus app and Inter-App Audio, which provides one interface for producers to create and record music using DAW, FX and instrument apps. Users simply connect the RMX-1000 app to their Audiobus app and Inter-App Audio to start adding FX to music they’ve made using Audiobus app and Inter-App Audio compatible DAW apps.